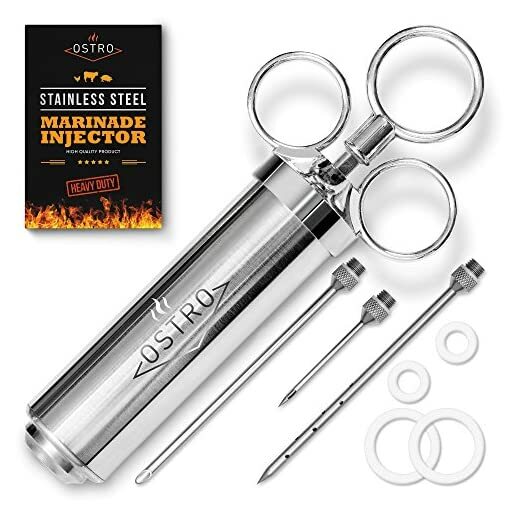 The OSTRO meat injector set guarantees that you will always cook tasty juicy meat. 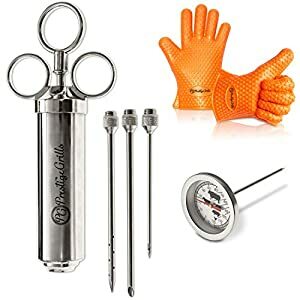 Great for BBQs, grilling, roasting, baking and cooking. 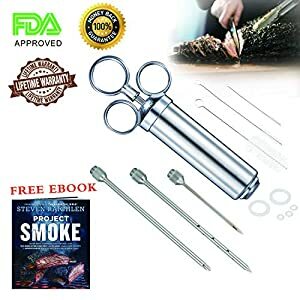 You can inject cajun or any other seasoning to: beef, pork, lamb, chicken, turkey – any meat. 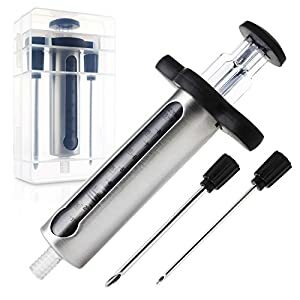 Using the meat injection marinator, you won’t have to wait many hours for the marinade to soak the meat. 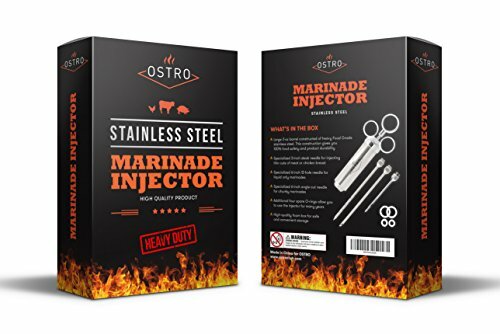 Super-sharp needles of different diameters and constructions provide a deep and equal distribution of the marinade and spices. 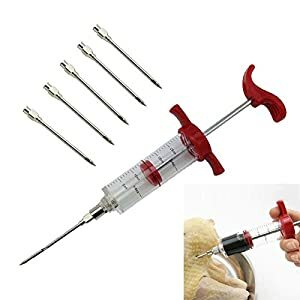 specialized 6-inch angle-cut needle for chunky injector marinade. 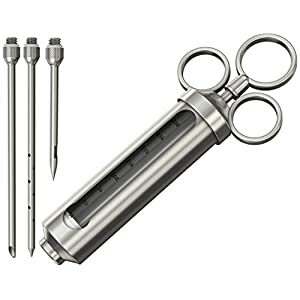 The stainless steel meat injector is the most reliable and durable of all marinating accessories. 100% high-quality stainless steel without alloys provides a sturdy and comfortable construction. All the parts are removable and of high-quality. 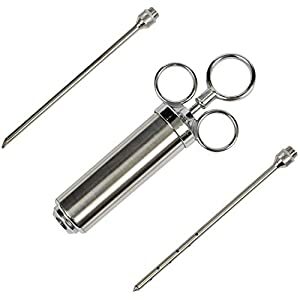 You can easily take apart the food injector syringe kit and clean thoroughly after usage. 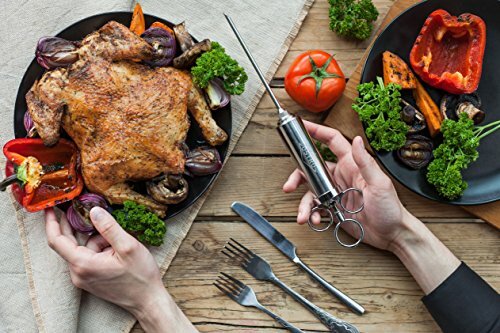 ✓ The large-volume (2 ounces) meat injection syringe is convenient to use – you pour the marinade in the syringe once and you can marinate even a big piece of meat. 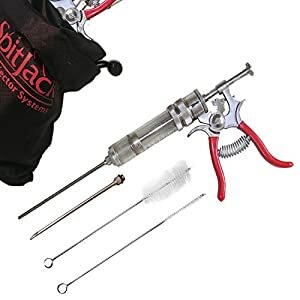 ✓ The construction of sauce injector is comfortable to use with one hand. ✓ The packaging includes a foam tray with form-cut slots for all the pieces and a thick box for dry storage. ✓ The OSTRO marinade injector for turkey, pork, beef makes an awesome gift for family and friends.